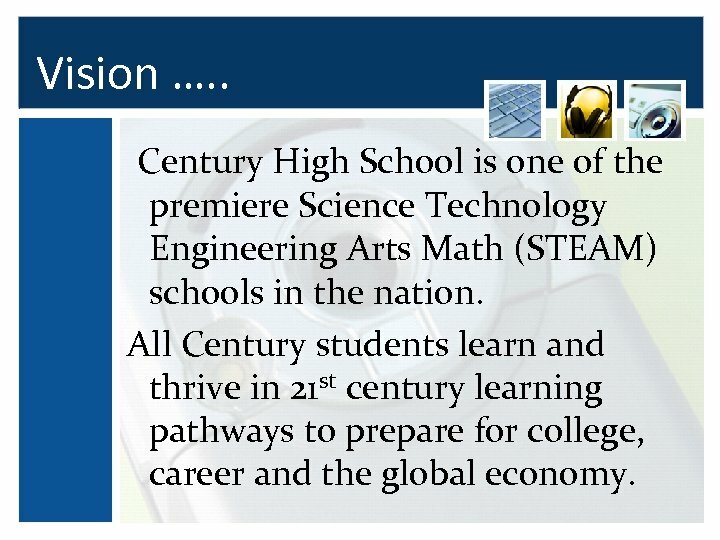 Vision …. . Century High School is one of the premiere Science Technology Engineering Arts Math (STEAM) schools in the nation. 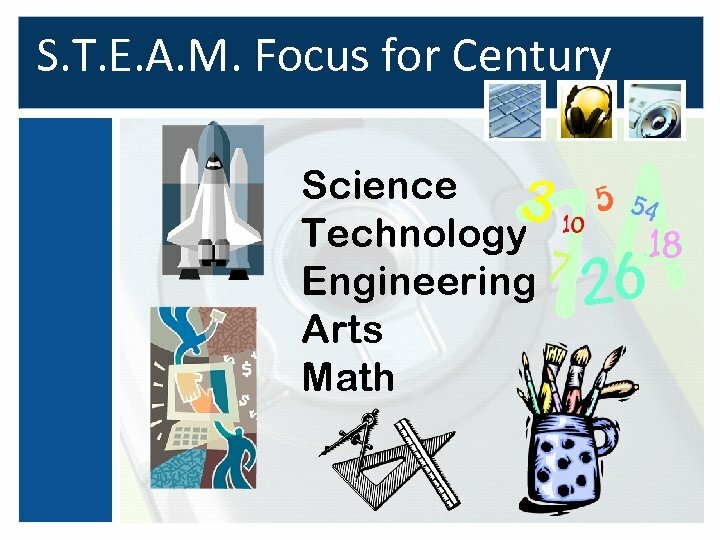 All Century students learn and thrive in 21 st century learning pathways to prepare for college, career and the global economy. 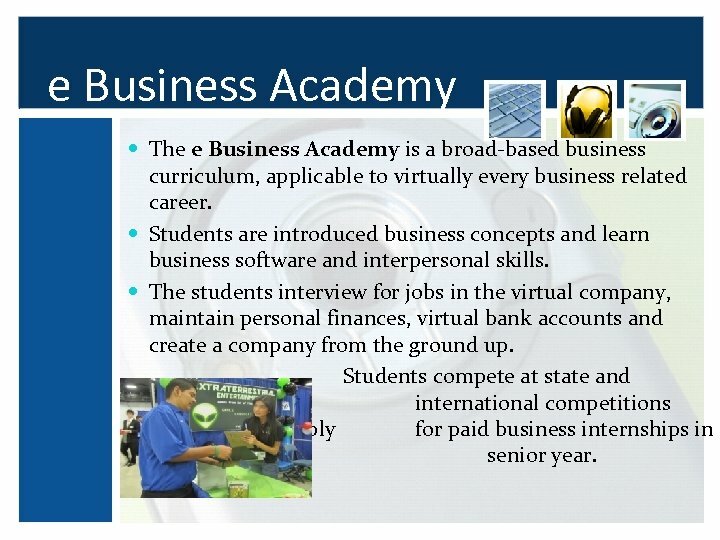 e Business Academy The e Business Academy is a broad-based business curriculum, applicable to virtually every business related career. 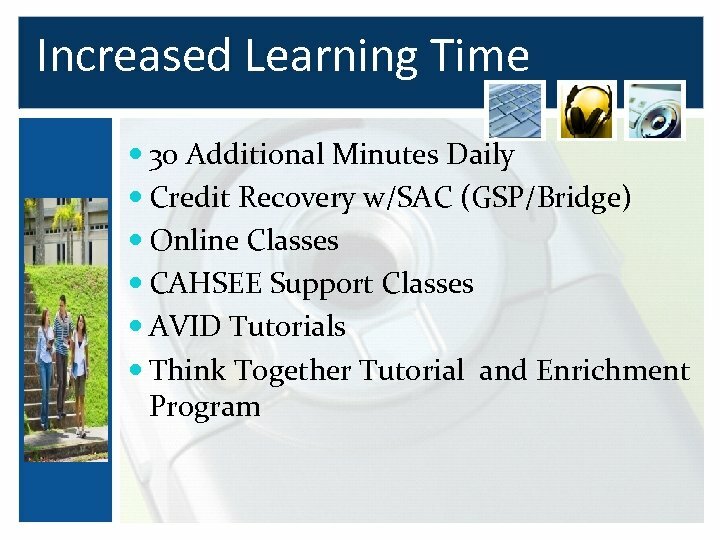 Students are introduced business concepts and learn business software and interpersonal skills. 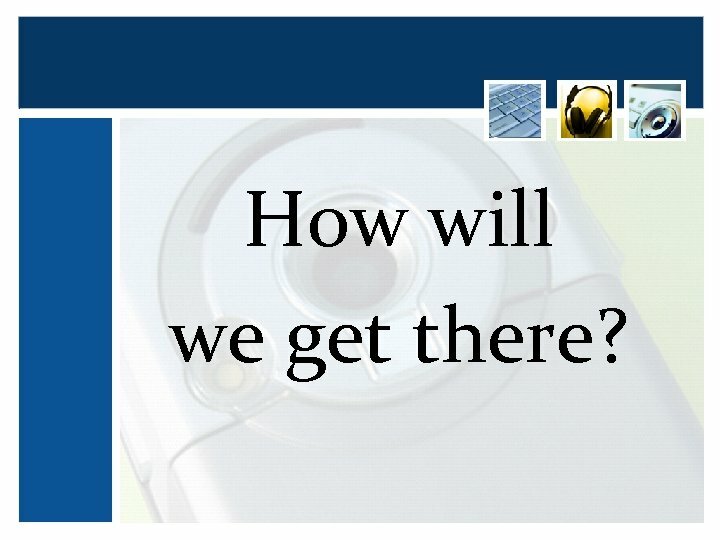 The students interview for jobs in the virtual company, maintain personal finances, virtual bank accounts and create a company from the ground up. 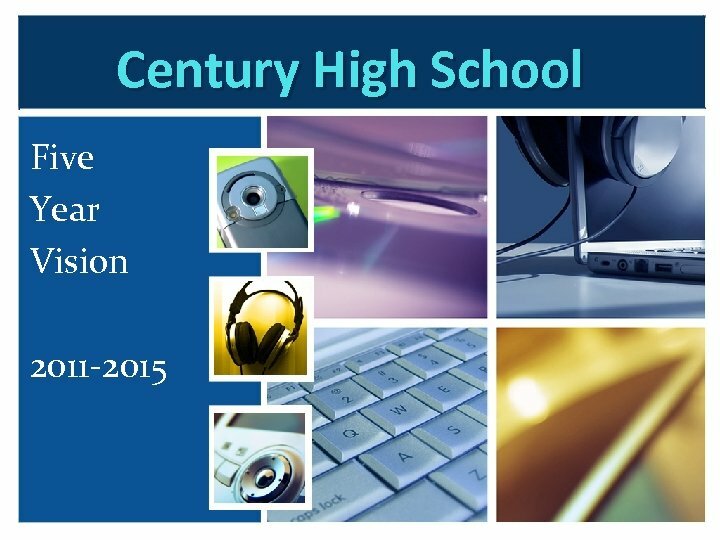 Students compete at state and international competitions and apply for paid business internships in the senior year. 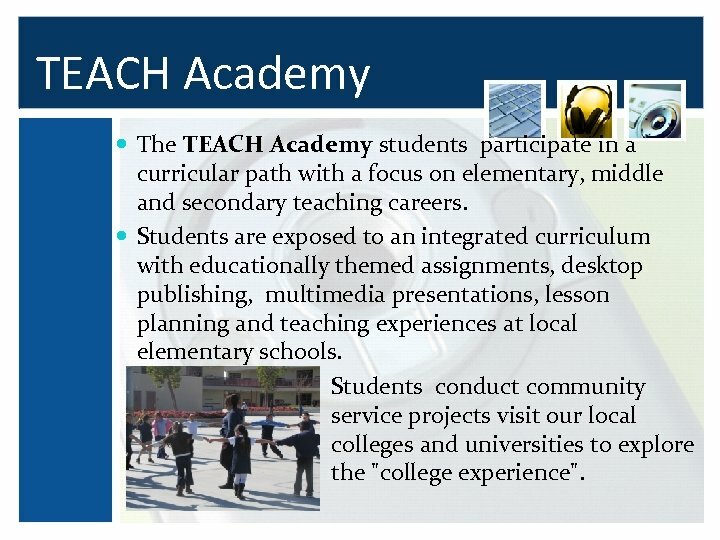 TEACH Academy The TEACH Academy students participate in a curricular path with a focus on elementary, middle and secondary teaching careers. 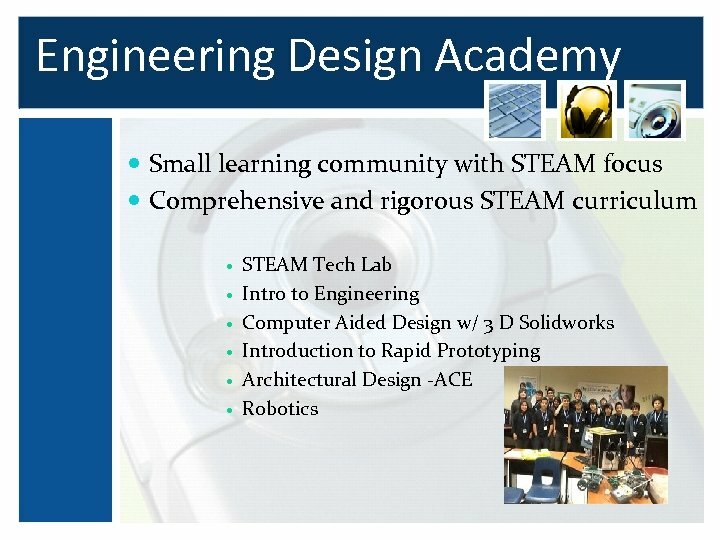 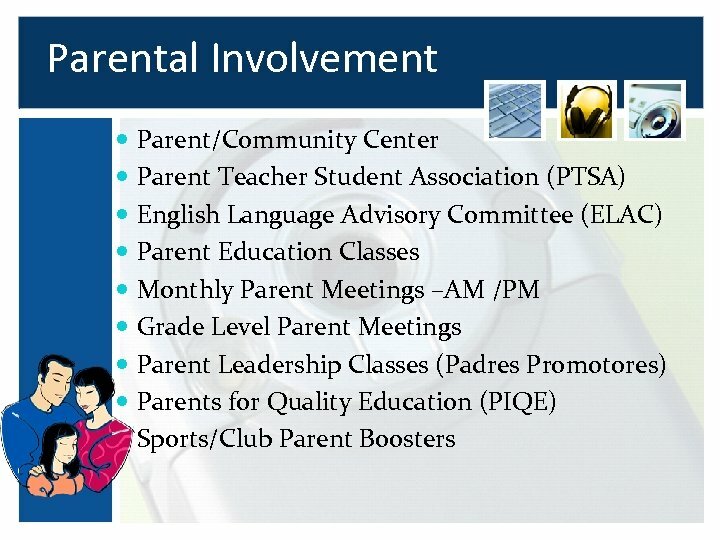 Students are exposed to an integrated curriculum with educationally themed assignments, desktop publishing, multimedia presentations, lesson planning and teaching experiences at local elementary schools. 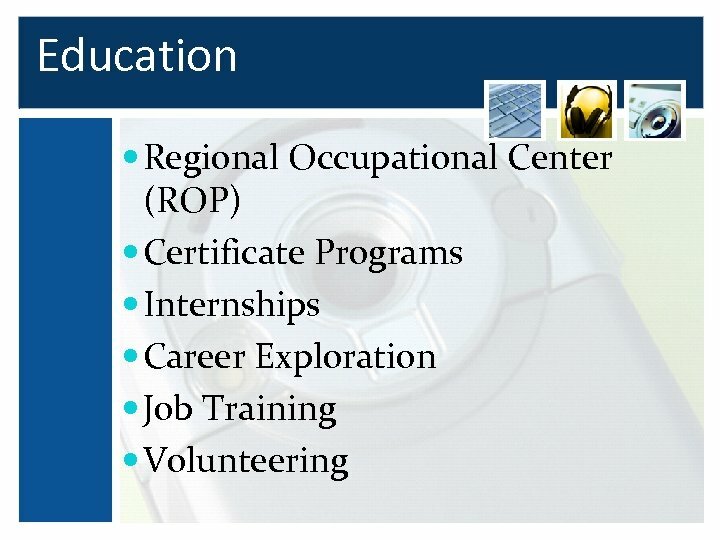 Students conduct community service projects visit our local colleges and universities to explore the "college experience". 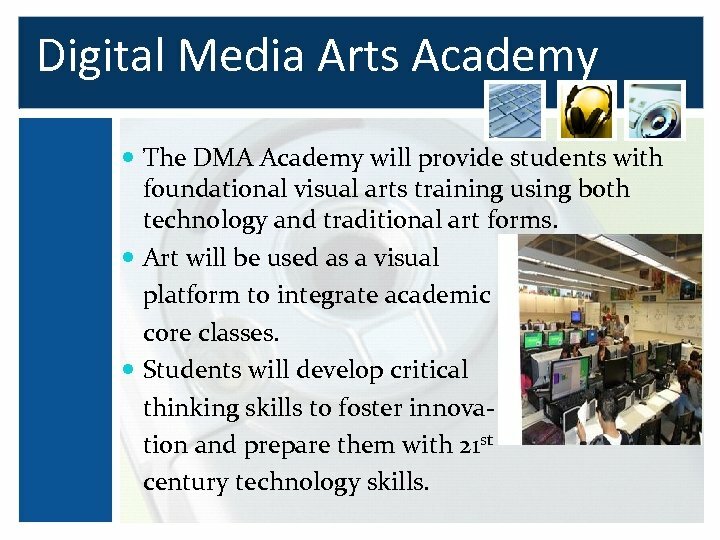 Digital Media Arts Academy The DMA Academy will provide students with foundational visual arts training using both technology and traditional art forms. 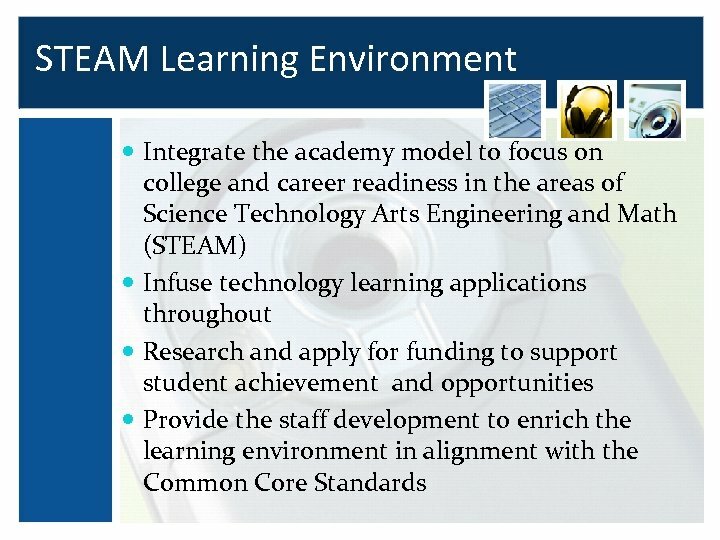 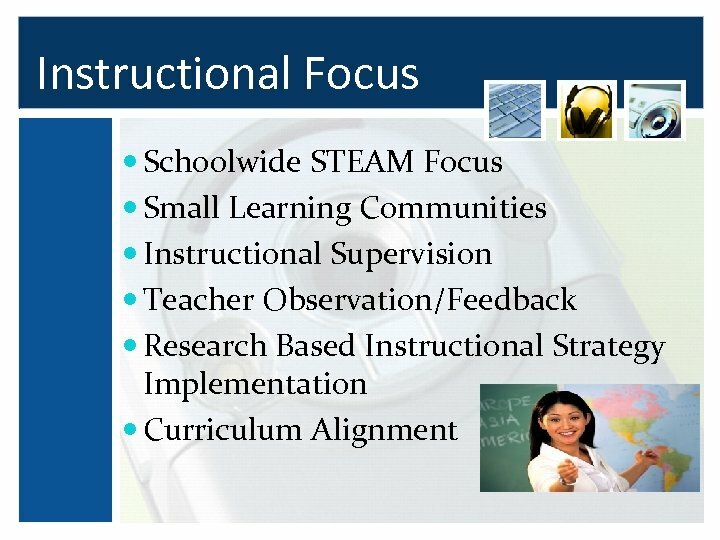 Art will be used as a visual platform to integrate academic core classes. 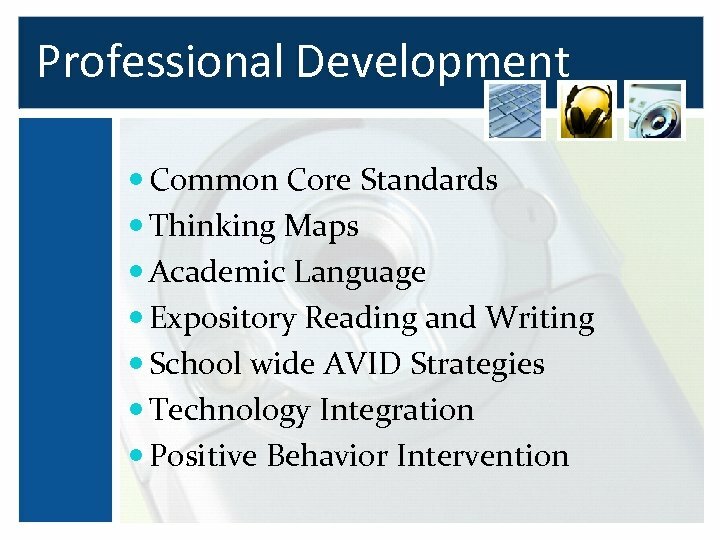 Students will develop critical thinking skills to foster innovation and prepare them with 21 st century technology skills. 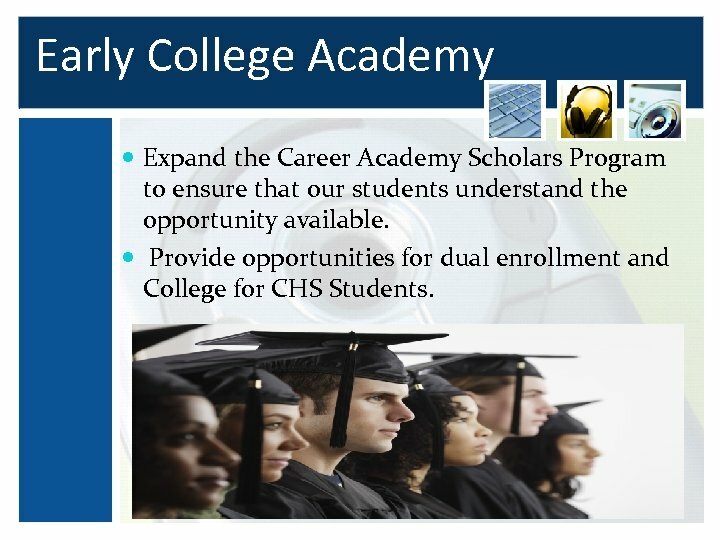 Early College Academy Expand the Career Academy Scholars Program to ensure that our students understand the opportunity available. 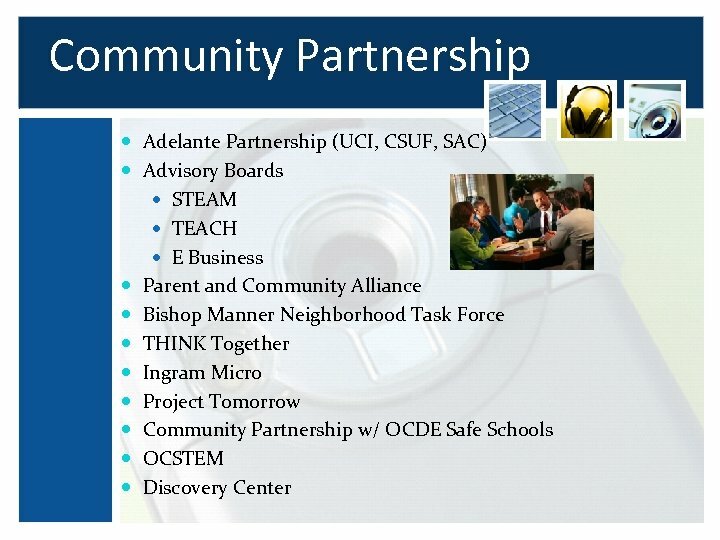 Provide opportunities for dual enrollment and College for CHS Students. 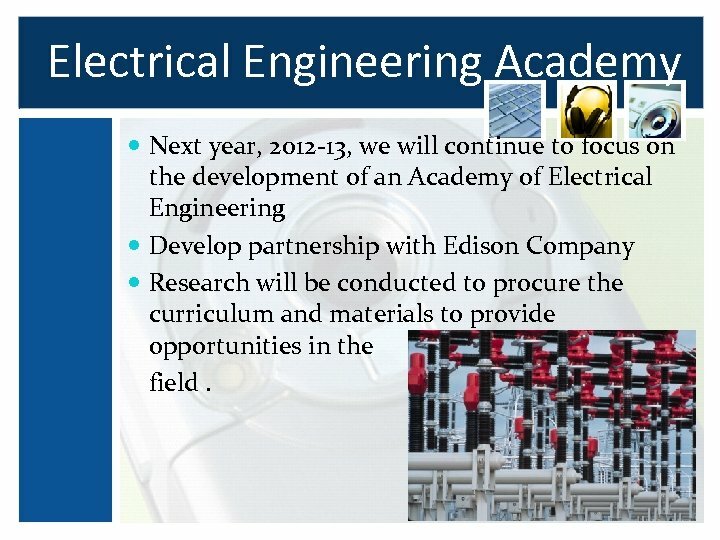 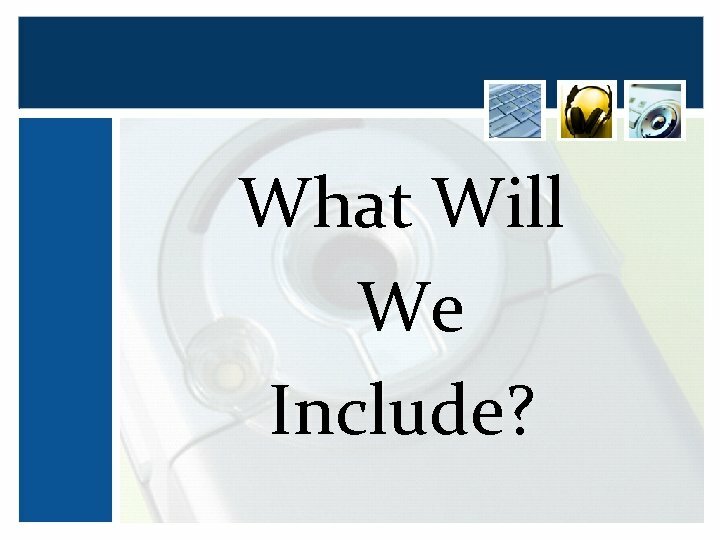 Electrical Engineering Academy Next year, 2012 -13, we will continue to focus on the development of an Academy of Electrical Engineering Develop partnership with Edison Company Research will be conducted to procure the curriculum and materials to provide opportunities in the field.